Wait, I’ve seen this one before, back when it was called Please Rob Me and based on Foursquare. The folks (folk?) behind the latest “social networking privacy experiment” called We Know Your House have just brought their website back online, following a swift takedown of their Twitter account after media reports disclosed what they were up to. In case you missed it: We Know Your House is an attempt to raise awareness about the information people casually, and unknowingly, reveal when posting to social networks. In this case, We Know Your House shows the tweets from people posting that they’re at home and then links those tweets to an actual street address, as provided by Twitter’s geolocation data. The site first started making the rounds on Monday, when outlets like Cnet and security blogs like Sophos detailed what was going on. 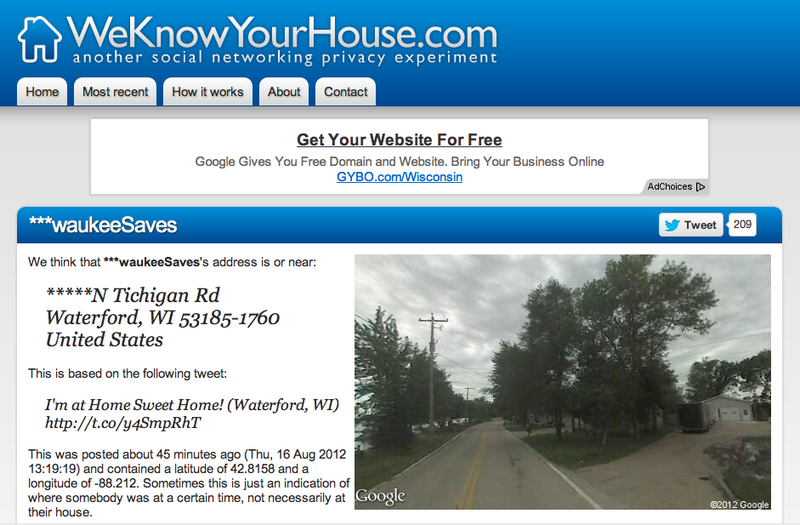 According to the We Know Your House’s FAQ, the site uses the Twitter Search API to collect information (here’s an example query), and then pulls out the tweets which contain geolocation data. This data is provided in latitude and longitude format, which We Know Your House then converts to human readable street addresses. Despite the uncomfortable nature of what the service is doing – with (partially censored) Twitter usernames, addresses and even Google Street View data – the goal is not to create a database for stalkers. The data is displayed on the homepage for the past hour only, and after the hour is up, it’s deleted from the page and can no longer can be accessed…or, at least, that’s what the website states, if you want to believe its anonymous creators. Again, the creator(s) stressed that they’re not doing anything beyond trying to raise awareness – they’ve censored the addresses on the website, but there are those who may be doing something similar privately, they warn. And that’s the real problem. The site’s launch and subsequent relaunch comes at a time when the issues surrounding geolocation and privacy were again thrust into the spotlight as Alexa Dell, the daughter of Dell founder and CEO Michael Dell, saw her own Twitter and Instagram accounts shuttered. Apparently, Alexa had been tweeting and posting photos geotagged with her location, while also detailing exactly what she was doing – like arriving in NY, having dinner, heading to an event, etc. Michael Dell, who pays around $2.7 million a year for security for his family, was not likely amused and the accounts disappeared. This happened soon after Alexa’s brother Zachary showed up on the Rich Kids of Instagram tumblr (photo is now down) aboard the family jet. We Know Your House, with fortuitous timing, is able to now capitalize on the renewed interest in social networking privacy – but it’s an issue that seems to pop up fairly regularly here on the Internet. Besides the above-mentioned Please Rob Me (a similar effort that used Foursquare not Twitter), we’ve seen the Girls Around Me app and a tool plainly named Creepy arrive, generate outrage, and then become forgotten over the months and years that follow. In a recent thought-provoking post from Amit Runchal for TechCrunch, he argued that there was too much blame placed on the victims in these scenarios. To some extent, I agree. But this isn’t always a “her skirt was too short” situation – as the Alex Dell situation proved, sometimes there’s just a need for increased parental oversight and awareness. Maybe We Know Your House will help. Parents, are you talking to your children about the dangers of Twitter? Here’s a pamphlet that helps.